In the my last article, I briefly discussed the role of horizontal gene transfer in bacteria...specifically the development of mosaic pathogenicity islands in Escherichia coli. 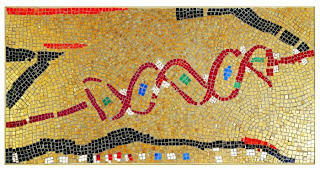 However, the formation of mosaics are not just limited to operons within bacterial genomes. In fact, we can see such events in phage and viral genomes. This article is part two in a brief series on genomic mosaicism. Current research shows that illegitimate recombination events create mosaics of unique genes within the genome. Each gene then acts as an individual unit upon addition, whereby beneficial genes are selected for and remain in the genomes, and non-beneficial genes build up mutations or are dropped. Illegitimate recombination, by definition, occurs within gene boundaries, and as such, highly unique and variable regions within genomes are formed. Looking within the sequenced genomes of the mycobacteriophages (an obvious interest of mine) we see a large amount of mosaicism. Small sets of genes, individual genes, and parts of genes are constantly being shuffled in, out, and around genomes. There are countless examples of gene insertions and deletions in the phage genomes, adding to the case that genomes are liquid and constantly changing. We see gene swaps not only between phages, but also between hosts. 8)not to mention the countless (30-50%) number of open reading frames with absolutely no homologs in the current databases or which only match other phage proteins. What I am trying to drive home here, hopefully with some success, is that life at the small scale is ever fluctuating and massively interconnected. Nothing in biology is genetically isolated. We are the current homes of many genes, where they end up next is up to our viral and phage couriers. Also, visit The Phamerator to explore the sequenced mycobacteriophage genomes on your own.